Decades of expeditions. Thousands of kilometers of traversing the most challenging terrain. Years of living and evolving with a machine that responds to the mountains. 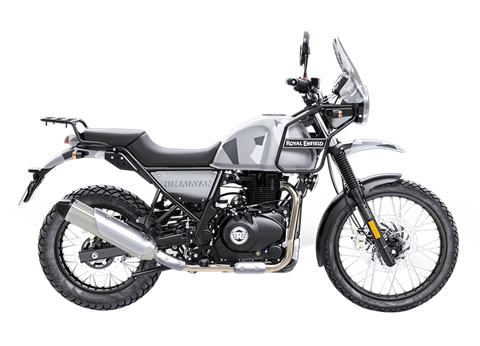 That's how we made the Himalayan, our first dual-purpose motorcycle. Here is how it was built to be tough, versatile, and adaptable to all kind of terrain. ADVENTURE-READY HANDLING: The half-duplex, split-cradle frame and long travel suspension keep you in harmony with road, rocks, and everything in between. VERSATILE PERFORMANCE: 800 mm seat height, perfectly-positioned foot pegs and handlebars reduce fatigue and give you a comfortable upright riding position whether you sit or stand. TOUR-MINDED DESIGN: Panniers at the back. Jerry cans in the front. The Himalayan's mounting points let you strap up and set off anytime. The LCD dashboard lets you track everything from miles to maintenance. PREPARED FOR CHALLENGES: Upswept silencer and 220mm of ground clearance keep you clear of all obstacles and ready to take on all kinds of terrain. FOR A STEADFAST RIDE: Hefty 17 in. and 21 in. wheels with dual purpose tyres, for a steady grip on all roads and no roads. Front - 90/90 - 21 in. Rear - 120/90 - 17 in.